Penny: Thank you for asking. It’s always a pleasure to connect with people from other parts of our globe and find out how much we have in common. Aneeta: Let’s start with something about you. Tell me about where you grew up, your family background and where you live now. Penny: Los Angeles, California was my stomping ground as I grew up. After graduating from high school, I attended the University of Southern California and graduated with an MBA in Finance and Business Economics. My work experience includes 10 years in the technology industry – way back in the early 70s when Honeywell and IBM were deciding whether to enter the desktop computer market. I remember top management at Honeywell where I was Manager of Planning and Analysis coming to the conclusion that nobody would want a small computer. Guess they were wrong. Anyway, I spent 3 years in Massachusetts, and then decided to return home to Southern California. Two years later, I got married, moved to San Diego, and had a baby. Fortunately we were in a position for me to stay home a raise our children. That was when I began quilting. 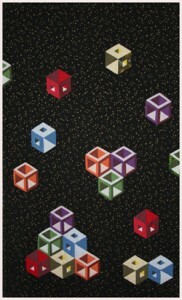 Aneeta: I know of your work because of your site, http://www.how-to-quilt.com. Tell me a little about how you came to have a website on quilting. Penny: When I was pregnant with my first child, my mother-in-law told me that she would buy a quilt for my baby once I found one I wanted. Prior to that, a quilt wasn’t even in my vocabulary. Certainly I had seen many blankets, but I didn’t know the difference between a blanket, a bedspread and a quilt. Although I searched for months for a baby quilt, I never found a one I liked, so I decided to make one; and I haven’t stopped making them. Once both of my children were off to college, I decided to share my love of quilting with beginning quilters and turn that passion into a business. I looked around at the resources for beginning quilters, and remembered how difficult it was for me as a beginner in the early 80s. I was very lucky here in La Mesa, the tiny town I live in, that there was a real quilt shop, with hundreds of bolts of 100% cotton fabric and a mother-daughter team who were passionate about quilting. Even so, the “take-home” resources for beginners were pretty poor. My learning came from workshops and wasted fabric (trial, error, and throwing mistakes away). I decided that what beginner quilters needed was a step-by-step guide that would walk them through one quilt, from start to finish, sharing all of the tips and tricks along the way. Once they finished that simple quilt, they would have a solid foundation for their quilting journey. Aneeta: I can now see that there are off-shoots to this site in that you’ve got two other sites, http://www.Rag-Quilt-Instructions.com and http://www.Fabric-Postcards.com . What do these new website focus on? 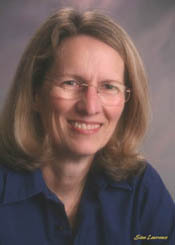 Penny: Once my first book, The Beginner’s Guide to Quilting, Vol. 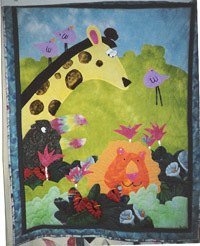 I, was finished and the website was up and running, I noticed that there were a lot of people interested in rag quilts. Using the same idea, I wrote a step-by-step guide for making a simple rag quilt. Several months after that book was complete and the site was online, I added the “Red Hat Supplement” to interest ladies in the Red Hat Society. Then, in paging through quilting magazines and surfing the internet, I found that folks were interested in fabric postcards. So, I created resources for beginning quilters to make fabric postcards. The first fabric postcard book is a step-by-step guide for transferring photos onto fabric, postcard size. This book has been very popular, since using fabric photos is becoming very common now. In addition, last May, I decided to begin a fabric postcard project where quilters can make fabric postcards to be sent to the troops in the Middle East. This has been quite a popular project, and has now expanded into Canada, to support Canadian troops in Afghanistan. To date, we have shipped more than 1,535 fabric postcards, all hand made by quilters, their family and friends, and children in local schools. Aneeta: I’m curious about something. Years ago, I made a card using some left over fabric. My intention was to use it as a postcard. However, when the time came to post it, I was told to put it in an envelope as it did not qualify as a postcard – apparently, postcards had to be absolutely flat and preferably, printed. With your Fabric Postcards, do you face such a problem and if so, how do you overcome it? Penny: When I finished my first fabric postcard, I was afraid that the post office would make me put it in an envelope. However, online, I saw pictures of fabric postcards that had been sent through the mail, since they had stamps and post office cancellations on them. So, I was somewhat encouraged. I read the post office regulations, which indicated that postcards could include non-traditional forms. Then I took my fabric postcard to the local post office and told them I wanted to mail it. The clerk suggested that I put first class postage on it, even though I was well within the requirements for postcard rate. She said that post office workers were more likely to treat it well. Since then, I have read that if you have buttons, ribbons, or other embellishments on your card, it’s best to put it in an envelope, since those things might fall off or be damaged. I have heard of companies sending coconuts through the mail. Imagine, bare coconuts! They are addressed, and have first class postage on them. How the postage sticks to the coconut is beyond me. But I think that if the post office is willing to deliver a coconut not in a box, once it gets past the clerk at the desk, a fabric post card should be easy. Aneeta: I’ve read your many newsletters and it’s obvious to me that quilting and storytelling are somehow inter-related. Am I right in saying this? 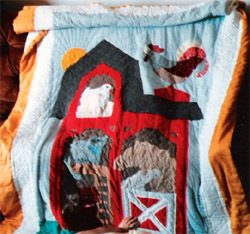 If so, can you please share 3 stories about the quilts you’ve made – whether they be stories about the process of making quilts or the stories within the quilts themselves. Penny: I think everyone remembers their first quilt – whether it is a pleasant experience or not! My first quilt came about because my mother-in-law said she would buy a quilt for my new baby. I knew nothing about quilts. I liked the idea, so I started looking around for one. After a few weeks, I gave up and decided to make one. Probably because I was unfamiliar with quilting, the thought of a patchwork quilt didn’t really appeal to me, so I chose a pattern that was a barnyard scene. Mothers and babies seemed like a good theme for a new baby human. The quilt ended up being quite an undertaking, especially since I had never done appliqué or quilting. Fortunately I had a friend who was an excellent quiltmaker, and she was more than willing to help me with the project. The baby was born long before the quilt was finished, and I spent many hours watching my newborn and making this quilt. The was on her bed until she was about 10 years old and decided that she wanted something a little more feminine. Many years after I began quilting, I became interested in how shades of fabric create three dimensional affects. One of the books that I used as a resource included a pattern for a wall hanging with the 3-dimensional boxes you see in the quilt pictured on the left. My original plan was to duplicate the quilt pictured in the book. However, my first departure was to make 3 of each of the blocks, instead of the 1 called for in the pattern. Once all of the boxes were done, I looked at the background on the quilt in the book. It was made up of about a billion little triangles, and looked like it would be no fun to put together, so I decided to design my own background. As I looked at all of these 3D boxes laid out on my design flannel, somehow they looked like boxes floating in space. Tucked away in my fabric stash was a piece of black fabric that had gold stars sprinkled on it. Perfect! The boxes were placed in groups on the black fabric, and then I set about sewing them – first to each other, and then to the background. Even though I had done several appliqué quilts, for some interesting reason, I decided that it would be better to cut the background fabric and then sew the boxes into holes. That was a mistake….I spent hours getting the corners square, and some of them aren’t right, but at least it was done. Years later I still wonder why I didn’t just appliqué the blocks onto the background. For the quilting, the original plan was to quilt a sun in the top center, and simply quilt straight lines, or sunrays, at angles down the quilt. Easy. The quilt was finished, binding was applied, and it was hung on the wall. Later that day, I noticed that there were huge gaps of fabric hanging out and away from the batting – looking pretty bad. That was when I discovered that fabric by itself has no real structure, that it’s the seams that make the quilt top hang straight. And this quilt had very few seams. The only solution was to do more quilting. So I filled in the spaces with quilting stitches outlining spaceships, planets, stars, and other things that relate to space – including some images from StarTrek. One of the stories I tell on my website is of my daughter when she wanted to learn how to make a quilt, and how she didn’t want to learn from me. So I taught her sewing teacher how to quilt, so the sewing teacher could teach Stephanie. Given that as a background, you can imagine how pleased I was that Stephanie has continued to quilt, and has designed and made some really fun and interesting quilts herself. When Stephanie was in college, we decided to go on a quilting retreat together. She signed up for classes that interested her, and I signed up for some that I thought would be fun. One of the classes she signed up for was a 2 day workshop, and the teacher was very critical of everything Stephanie was doing. Needless to say, she was not looking forward to going back for a second day. The teacher of the workshop I had registered for the second day seemed like a great gal, and I asked her if Stephanie could join our class. She agreed, on the condition that we would work on the same quilt. That night, we looked at the class materials list and our fabric stack and came up with a fabric pile that was fun and very different from what I had planned. In class, we arranged ourselves as a kind of assembly line – I cut, she sewed – so by the end of the day, our quilt top was almost finished. She went back to college; I was tasked with finishing the quilt. And now, 4 years later, the quilt is almost fully quilted. Any year now, it will be complete! 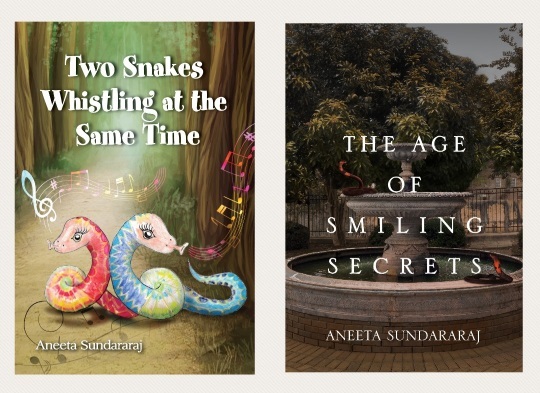 Aneeta: There are, obviously, many kinds of stories with specific themes – fairy tales, adventure tales, romance, horror stories and so on. When you first make a quilt, how to pick such a theme? Penny: It’s interesting that you ask that question. I have never really thought about the correlation, but in many of my quilts, there is. The 3 dimensional blocks above took on a science fiction/space theme. I think the theme kind of evolves as I make the quilt. Generally I find a block pattern or design which appeals to me for some (usually unknown) reason. Then I start looking at color and fabric, and a theme comes from there. Another good example is the quilt Stephanie and I made together. It started out as a collection of fun, bright, somewhat bizarre fabrics. We had no idea what the design would be, we just picked a stack of fabric. As the quilt was made, it ended up turning into a kind of circus, party themed quilt. When I make a quilt for a specific individual and occasion, I take into consideration the occasion and the personality of the person. One year, I made a Christmas quilt for a friend. She was a very precise, exacting person, and I chose a Santa Claus pattern that had Santas and trees all lined up, but they had fringed beards and actual bells on their hats. The picture on the left is the full quilt, with a close up of the Santas and trees. Another quilt I made (shown on the right) was for a new baby who was born with cystic fibrosis. Her mom was Stephanie’s 5th grade teacher. Stephanie picked the design from a Thank You card, because we were all very thankful that the baby survived and came home from the hospital relatively healthy. This quilt is still probably one of my favorite quilts. I’m not sure whether it’s because of the quilt itself or the memory of the success and the health of the baby (who is now in high school). Aneeta: You’ve probably heard this a thousand times before and I’m sorry my question might come across as being trite but, I’ve wanted to ask this from the moment I first came across your site. When I read about your work, one of the things that popped into my mind was that movie, How to Make An American Quilt. Do you have a quilting group and indeed, are they very much like the characters in the movie? Penny: When my kids were in elementary school, four of us moms got together once a week for an evening of quilting. The talk was about school, teachers, kids and husbands. Although it wasn’t quite as interesting or dramatic as How to Make An American Quilt, the discussions about family, friends and what was going on in the community was fairly similar. Although I have to say, we didn’t get into some of the more intimate details they got into in the movie. Aneeta: As you know my site caters for storytellers. Do you have any advice for them? Penny: The advice I have is “Tell your story.” I used to think that my collection of stories was boring and meaningless. As my parents have gotten older, my kids and I have pulled stories out from them, and I am finding them fascinating and a real insight into them and their trials and successes. Aneeta: Penny, this is all I have to ask. Is there anything you’d like to add? Penny: Your website is wonderful, and an excellent place for people to learn how to jump-start their storytelling skills. And thank you for giving me an opportunity to tell mine. Aneeta: You are most welcome.